My goal this week is to cook all our dinners because we’ve been eating out way too much this month. We’re busy like everyone else, but I need to get control of this time crunch issue. Today’s recipe is a combination of an easy gnocchi recipe and my favorite vodka sauce from Cooks Illustrated. This recipe uses a food processor, but can be made in a stand mixer with a paddle attachment instead. Each batch serves about 3 people, if you need more gnocchi make a second batch. 2. Meanwhile, place the water, egg, butter, salt and garlic powder in the food processor. Process until combined. Add the flour and pulse to mix in. Add the potato flakes and pulse to combine. There's enough sauce here for two batches of gnocchi. 1. Make gnocchi, set aside on wax paper. 2. Start heating heavily salted water for pasta. Puree half of the tomatoes in a food processor until smooth. Chop the remaining tomatoes into ½ inch pieces, discarding the cores. Combined the pureed and diced tomatoes in a 2-cup liquid measuring cup. Add reserved liquid to make 2 cups. 3. Heat the oil in a large saucepan. Add the onion and tomato paste and cook, stirring occasionally, until the onion is light golden around the edges, about 3 minutes. Stir in the garlic and red pepper flakes and cook until fragrant, about 30 seconds. 4. Stir in the tomatoes and ½ teaspoon salt. Remove pan from heat and add the vodka. Return the pan to medium high heat and simmer, stirring often for 10 minutes to cook off the vodka. (Lower heat to medium if simmering is too vigorous.) Stir in the cream and cook for 1 to 2 minutes until hot. 5. Cook the gnocchi according to the above directions. Drain and place gnocchi in a serving dish. Top with sauce, season with a little salt, pepper and handful of Pecorino Romano. Gnocchi original recipe source from About.com. Adapted by Laura Flowers for a one bowl method. Sauce recipe from "The Best of America's Test Kitchen, Best Recipes and Reviews 2008". Picture by Laura Flowers. 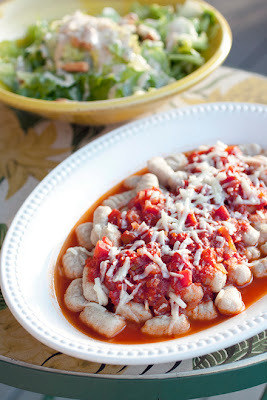 I love that you actually made the gnocchi to go with this creamy delicious vodka sauce! I would choose this over take-out any day! So funny, the blog I have scheduled to post tomorrow echo your sentiments about getting fed up with eating out. Thanks for this-the vodka cream sauce I made was HORRIBLE and I'd like to try again. Will do with this one. Your gnocchi looks delicious. Thanks for sharing your shortcut recipe. I actually made gnocchi a few weeks back from scratch...baking the potatoes and all - it was awesome!